Malapa (Afrique du Sud) : Preserved flesh of 2-million-year-old human ancestor found? Preserved flesh of 2-million-year-old human ancestor found? Scientists launch open research initiative to examine possible evidence of soft tissue among the 2-million-year-old hominin fossil finds of the Malapa caves in South Africa. His jaw must have dropped when he examined the material before him. It was a rare find. So rare, in fact, that, if what he was looking at was really what he thought it could be, it would be the first and only evidence of soft body tissue from an early hominin ever discovered.......soft tissue from an early (possible) pre-human ancestor nearly 2 million years old. 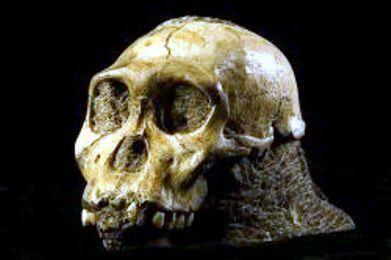 The find was part of the remains uncovered by paleoanthropologist Lee Berger of the University of the Witwatersrand and his colleagues when they discovered fossils of Australopithecus sediba, a possible precursor to our earliest human ancestors (the Homo genus) in the Malapa cave system of South Africa. "I was standing with Lee in his lab looking at what might be australopithecine skin" said Dr. John Hawks, a paleoanthropologist with the University of Wisconsin - Madison. "I'm not talking about an imprint of skin, like a skin cast. These appear to be thinly layered, possibly mineralized tissue". The possible mineralized skin tissue was found on top of the skull of the fossil remains of what was identified as a young boy, and on the jaw near the chin of a fossilized woman. 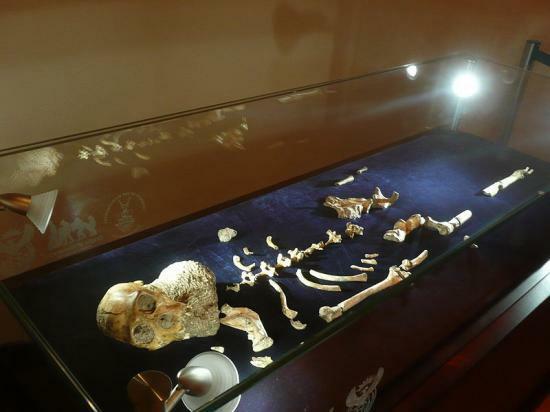 Scientists suggest that such surviving evidence is possible because the remains of the individuals found at Malapa were rapidly deposited and entombed in a thick layer of sand and clay through natural causes in a cave or shaft at or soon after their deaths. The relatively rapid burial of their bodies in this single layer of clay and sand, combined with the comparatively protected environment of the cave or shaft system, significantly slowed their decomposition. The same conditions also made it possible for scientists to discover the individuals in articulated condition (body elements or parts arranged as they were "connected" in life as a single individual), a rare find, particularly for early hominins. If further research and testing confirm the substance as genuine, preserved skin, the implications for additional study and knowledge obtained from that discovery could be enormous. For example, many scientists have theorized that the development of larger brains in our early human ancestors required a more effective cooling system to develop and function. Examination of the evidence of sweat glands and hair on the scalp and jaw of the Australopithecus sediba specimens could provide a basis for comparison with that of chimpanzees or other apes, hairy primates that are known to have less effective, less efficient biological cooling systems. With the objective of studying the finds with the best possible process and resources, Berger and Hawks have initiated an "open science" research project, designed to tap world-wide scientific expertise, equipment, techniques, and analysis coupled with transparency that has previously been lacking with other research endeavors in the past. Called the Malapa Soft Tissue Project, it is hoped that, once the research is completed and results and conclusions are realized, announcement and publication will be received with comparatively less controversy and scholarly contention or debate than what had been experienced with other projects, such as the dinosaur "soft tissue" discoveries and studies of recent years. "Science done by a closed process means fewer eyes looking at data, and too many chances for errors to pass unnoticed," says Hawks. "An open process has the chance of improving research by broadening it. We want stronger, clearer results, and we want to anticipate every important criticism. If a significant comparison can be added by people who have the right tools, why not get those people involved? If we stand a chance of finding those people by making the process more open, why not do it?" He has set up a home page for the project. As the online headquarters of the work, it will post all project updates and generate suggestions and results. Hawks and Rachelle Keeling, the Project coordinator, will be requesting participation and input from anyone with expertise and ideas. Says Hawks, "we're going to ask people to participate in the project, perform research, and coauthor the scientific work: this is real open science........this project will develop and I expect it to become more interesting as it becomes broader. I can't predict how it will end, and that's pretty exciting!" More information can be obtained from the Project website at http://johnhawks.net/malapa. Scientists and researchers interested in participating or providing input may contact Hawks and Keeling at skin@johnhawks.net. Malapa Soft Tissue Project, John Hawks Weblog.